I follow Sally Cronin’s Smorgasboard blog and know she writes on a variety of themes, from the non-fictional: nutritional and health advice, features and reviews about books and writing, advice on marketing and blogging, and also fictional writing. After reading some of the stories she had shared on-line I had to read this book. And the description is correct. These are fairy tales for children of all ages. The characters are the stone sculptures in the garden and their adventures contain in equal parts warmth, pathos, magic and fantasy. We have animals escaping from hunting dogs, impossible love stories between humans and fairies, orchestras made up of the most varied characters, and a wonderful dedication to her mother and her gardens. You will go through a variety of emotions and always feel better and more positive by the end of each story. The book will leave you smiling and that’s something that cannot be said of many books these days. 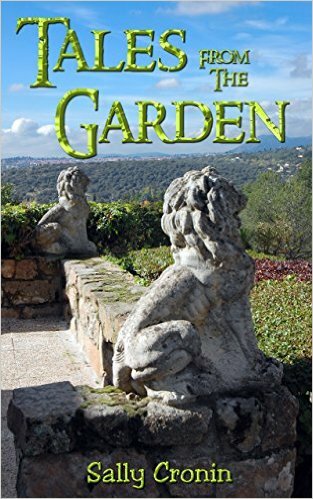 The writing is fluid, perfectly suited to the theme and you get the sense that you’ve been taken into the confidence of the characters and have become an honorary inhabitant of this wonderful garden. The pictures —all from the author and her family’s gardens— that illustrate the book help make the reader feel even more at home. Recommended to any readers who need a bit of magic and wonder in their lives. An Author and Blogger worth reading by an Author and Reviewer also worth reading. Highly talented people both. Lovely to wake up to find a review for Tales from the Garden by Olga Núñez Miret​ on Lit World Interviews. Now that we are leaving the garden and the very heavy statues behind I am so pleased that I wrote their stories to take with me. Thank you Olga.. it was a fabulous review. Thank you so much for the wonderful review Olga and so pleased that you enjoyed the stories as much as I did creating them. Really delighted. Thank you for reblogging Judith.. always grateful. Marvelous review, Olga. It’s wonderful that Sally created these stories as a way of remembering her lovely garden and keeping it with her — and even more so since she’s sharing them with everyone in this book. Mega hugs. Thanks, Teagan. Yes, it was a pleasure to re-read the stories again all in one go. They always bring a smile to one’s face and heart. Lovely review, Olga. I so enjoyed the stories on Sally’s blog and immediately thought they needed to become a book – children will be enchanted. Adults, too. I couldn’t agree more, Noelle. I guess we’re all children at heart. It is a gorgeous book. Thanks, Annabelle. This book looks lovely. Another one for my TBR pile. . . Thank you.. I had fun writing it.. Thank you for sharing Christoph.. much appreciated as always.